The NDDC is hosting a Bike Trail Update at their April Downtown Forum. The forum is Tuesday, April 6th, 8 a.m., in the Riverview Conference Room (lower level) of the historic Archer House River Inn, 212 Division Street. Two of the primary partners in Northfield’s on-going effort to expand and enhance regional bike trails, the Mill Towns Trail Group and the City of Northfield, will discuss recently-completed projects, projects scheduled for this year, and projects planned for the near future. 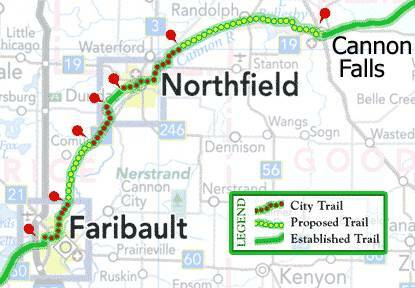 These projects, part of the segment between Faribault and Cannon Falls, will be discussed in the context of the overall vision of a major Minnesota bike trail that will link Mankato with Red Wing. The Mill Towns Trail Group will be represented by Peg Prowe and Glenn Switzer. The City of Northfield will be represented by Joel Walinski and Katy Gehler. The Group and the City have been working closely together in recent years to realize a shared vision for the community.